Cable TV is typically pay TV. Usually a monthly charge for basic channels plus optional premium channels. Cable TV traditionally was analog and any NTSC cable-ready tuner, in a TV or VCR could tune in analog channels without a cable box as long as they were unscrambled. Today, more and more the channels are digital and this requires a cable box or CableCard to decode the channels. Digital cable boxes are usually provided by the cable TV company for a small monthly rental charge. These set-top-boxes are more computer than TV tuner and some have a built-in DVR to record TV shows. Most digital cable providers offer a selection of programming packages, from basic channels to premium movie packages. The exact packages available depend on location, so check with your local cable provider. Some digital cable programs are broadcast in high-definition. However, keep in mind that just because something's digital doesn't mean it's HD. The term "digital" simply refers to how the signal gets into your home. A digital signal can provide both high-definition and standard-definition programs. You have two different ways to get digital cable: a cable box, or CableCARD on a HDTV with a QAM tuner and CableCard slot. Most folks use a set-top box in order to receive digital cable signals. There are a few different types of cable boxes. In addition to regular boxes, most providers offer some that are capable of receiving high-definition programming. Other boxes give you a built-in hard drive (DVR) so you can record your favorite shows. You may also find HD DVRs that allow you to watch and record programs in high-definition. The kind of box you need depends on the services you select. Your cable company will provide the box when you sign up for service. Keep in mind that you don't own the box, you simply lease it, so a small fee will appear on your cable bill each month. The good news is since you don't own the box, you can easily get a new one from your cable provider if you decide to upgrade your service at a later date. If you have more than one TV, you'll need a separate box for each television. A small fee for each additional box will also appear on your monthly cable bill. Many new HDTVs include a built-in QAM digital cable tuner. These tuners allow you to tune in unscrambled digital cable channels without the need for additional hardware such as a cable box. Simply connect the "coax" cable coming out of your wall to your TV, and you're good to go. You still need to subscribe to your local cable service, but you get the advantage of watching crystal-clear digital cable programs without another box taking up space. CableCARD is a relatively new technology that provides an alternative to a set-top cable box. Similar to a cable box, it decodes encrypted digital cable information so you're able to watch it on your TV. It plugs into built-in slots on compatible televisions, DVRs, and other Digital Cable Ready devices, letting you enjoy digital cable without the need for a separate box. On July 1, 2007, a new FCC mandate kicked in which requires all newly manufactured digital cable boxes to be compatible with CableCARD. This could benefit consumers by allowing them to purchase their own cable boxes and DVRs. You'd be free to buy whatever box had the features you're looking for, and you wouldn't have to return that DVR with hours of recorded programs if you move and change providers. After buying a box, you would contact your cable company for the CableCARD, and the card would give you access to your provider's cable system. Cable companies argue that it gives the box no added functionality, and the changeover to a CableCARD-based system will drive up costs which would be passed on to consumers. tru2way™ Similar to CableCARD, tru2way (formerly known as "OpenCable") is a technology that could potentially eliminate the need for a set-top cable box. TVs equipped with this technology could give you access to your cable company's program guide without the need for additional hardware. Standard definition video and high definition video use different cable connections for your TV. High Def video requires a HD cable box tuned to a HD channel along with a HDTV and either component video or HDMI cable connection. Component video uses three RCA cables color coded green, blue, red while HDMI is a single multi-pin cable. 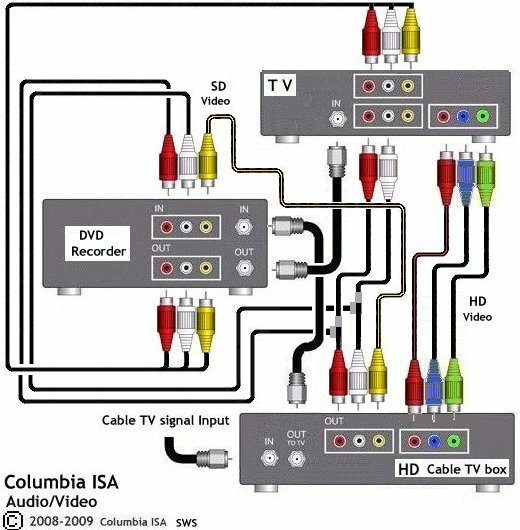 Component video requires two RCA audio cables (white, red) while HDMI carries both video and audio. 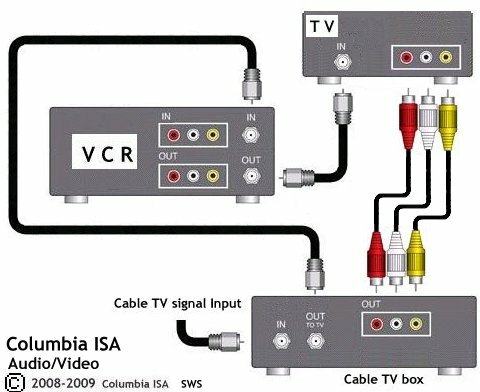 For a better picture and sound you can use RCA video (yellow) and audio (white and red) cables to connect cable box to TV. Select input on the TV. DVD recorders cannot record in HD, only standard definition. Most HD cable boxes will send standard definition out using the yellow video and white and red audio outputs. 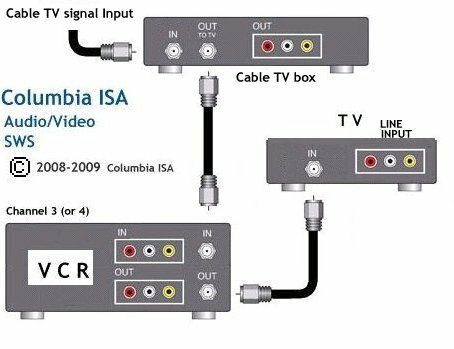 You can use a RCA cable splitter with one male and two female (YM2F) to connect both TV and recorder to the audio outs on the cable box. 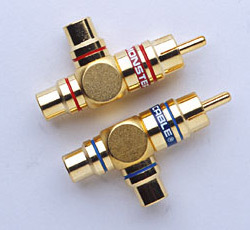 RCA audio cable splitter. One male and two female for each stereo channel.